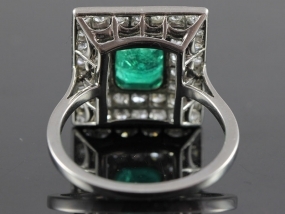 This is an Art Deco era ring that is breathtaking in its design and quality. 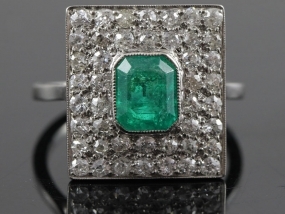 Taking center stage is a wonderful collet set 2 carat Colombian Emerald. From the deep, lush valleys of Colombia come the purest green Emeralds and here is a fine example. 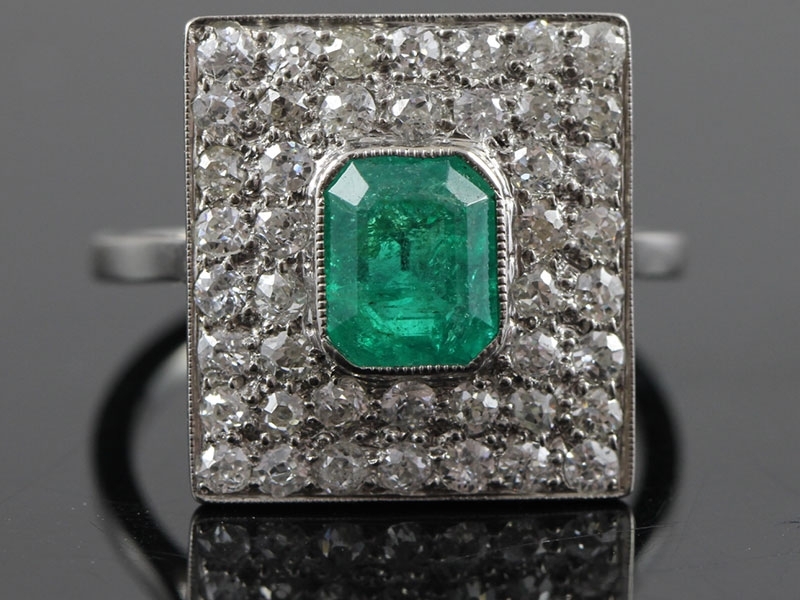 There is a wonderful clarity to the Emerald which is a pretty spring green colour. This stunning Colombian Emerald gleams from atop a square pavee set with forty four scintillating, bright white, old cut sparkling Diamonds weighing 1.76 carats. The Diamonds are cut beautifully and will be sure to catch one's eye. Amazing sparkle, and graceful proportions. 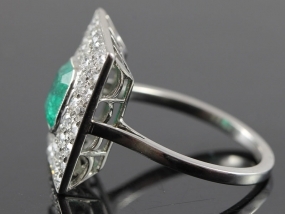 Stunning Emerald and Diamond Art Deco style cluster ring whose gemstones contrast and complement each other beautifully. Secure rub over and grain settings to enhance the beauty of the gemstones with simple shoulders to show off the setting. The shank is substantial, yet extremely comfortable to wear. 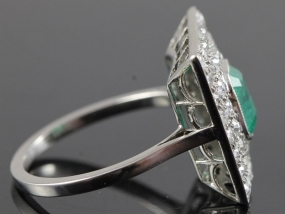 To the reverse the Diamonds and Colombian Emerald are set in open backed settings, this allows the light to shine through for that extra sparkle. 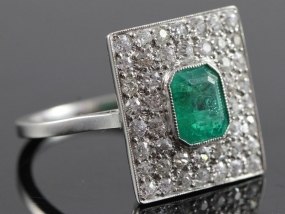 This is a spectacular example of a 1920's Art Deco ring that is sure to dazzle and impress all who see. Rings of this type are highly collectable and are sought after worldwide. This ring is sure to become a treasured family heirloom and would make a stunning engagement ring, or special gift for a loved one! 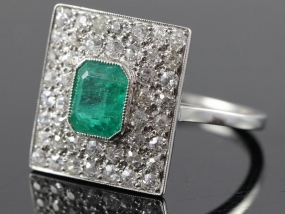 A rare and ravishing Jazz Age jewel. We are happy to provide a detailed professional appraisal indicating a replacement value for insurance purposes on request for your item on completion of the sale. Most rings can be professionally sized up or down one size unless noted and sometimes more in our own highly experienced jewellery workshops. Note: Stones have not been removed from their mounts to preserve the integrity of the setting. All Diamond and Gemstone weights have been approximated by measurement and formula and may vary from actual weights. All pictures are completely unedited but are zoomed in to show all detail. Please note that photographs are significantly bigger than the actual item and show any blemishes up more than in real life. All rings come in a free luxury presentation box.